Create with Traci: I did it!! The swap I found out about on Wednesday is officially complete... only problem is I've missed the mail for today and my local Post Office is only open 9-10am on Saturdays... and I really don't have time to drive into town to catch the big Post Office... I'll have to mail it Monday- but considering the fact that everyone else had weeks to order supplies, create and mail- I think I did pretty good. Here's the result. The only requirement was to use the Blue Ribbon Level 1 Paper Pack (which I didn't own). The pack includes Colonial White, Cranberry and Outdoor Denim cardstock- since I have about 55 of 60 CTMH colors- I did have that on hand. The pack also includes one sheet of this stripe paper- a 12x12 sheet... All I had was a little 6x6 swatch that I had to split between 7 cards!! Yikes- so they each have the little 2x2 square in the middle. We could use any stamps we wanted as long as they are CTMH... since it's a consultant swap. 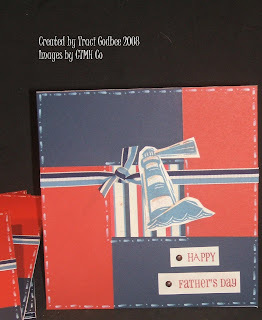 I used the lighthouse from the New Horizons Stamp Set and the "Happy Father's Day" is from the May Stamp of the Month. The ribbon is from the Outdoor Denim Designer Collection, brads are antique copper. The white "stitching" is done with the CTMH white daisy marker. Works GREAT!! Final size is 6x6- not my favorite size but it was the only option left when I signed up for the swap... I prefer standard size cards! Check back later- I've got lots of art to post at the moment but I'm busy working on Goody Bags for my crop next weekend!! Need to get that done before I play anymore!